fan speed control knob or button to a lower speed. • For maximum defrosting, set the temperature control to the extreme right/hot position and the fan speed control to the highest speed. • Clear all snow and ice from the hood and air inlet in the cowl grill to improve heater and defroster efficiency and to reduce the probability of fogging up inside of the windshield. If the air-conditioning and outside (fresh) air position are not selected automatically, press the corresponding button manually. 4. The air-conditioning will be turned on according to the detected ambient temperature, outside (fresh) air position and higher fan speed will be selected automatically. speed is switched to higher fan speed. 4. The air-conditioning will be turned on according to the detected ambient temperature and outside (fresh) air position will be selected automatically. return the defogging logic, do the followings. 2. 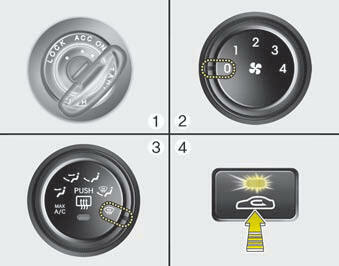 Turn the fan speed control knob to the “OFF” position. 3. 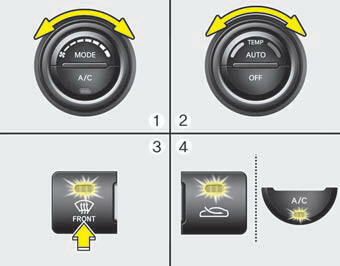 Turn the mode selection knob to the defrost position ( ). 4. 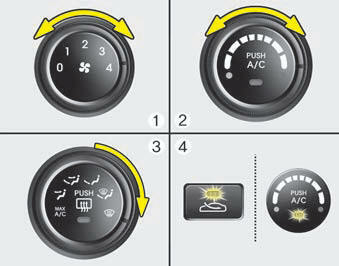 Push the air intake control button ( ) at least 5 times within 3 seconds. 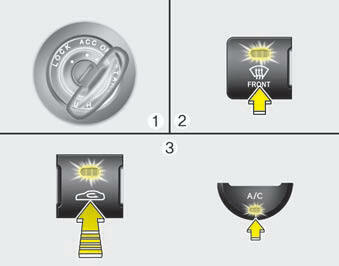 If the battery has been discharged or disconnected, it is reset to the default defog logic status.